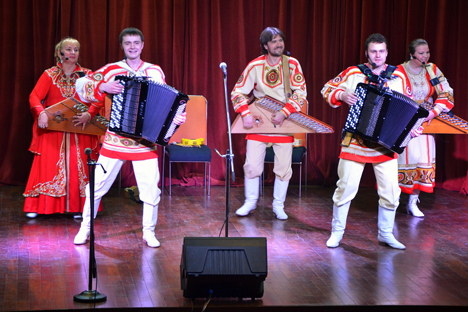 A team of seven professional musicians from Moscow presented a colourful performance based on Russian folk music, choreography and traditions. A concert by the folk music ensemble of psaltery players “Kupina” enthralled an enthusiastic audience at the Russian Centre of Science and Culture in New Delhi last week. The function, jointly organised with the Russian Embassy, was dedicated to the celebration of Russian Orthodox Christmas. A team of seven professional musicians from Moscow presented a colourful performance based on Russian folk music, choreography and traditions. Moreover, they performed Western classical and jazz items, using ancient Russian musical instruments. Psaltery was considered to be a symbol of Russian musical culture till the 18th century. These days, the art of psaltery playing is once again gaining popularity. Kupina, led by the Honoured Artist of Russia Prof. Lubov Zuk, comprised of Dmitriy Volkov, Daria Ogibalina, Alexander Zykov and Dmitriy Kukushkin. Each of the artists is a graduate of music academy and an expert in handling several musical instruments. They are also equipped with ensemble singing and folk choreography. This made their performance a real cultural extravaganza. In Delhi, Kupina performed together with sax-player Artur Loran and solo-singer Dmitriy Skorikov. The audience enjoyed golden oldies as well as modern compositions performed by the psaltery players in solo and in a group. The duets of psaltery and button accordion as well as psaltery and saxophone moved the audience. Adding a new life to the programme, the vocal items presented by Dmitry Shorikov, notable for his remarkable bass voice, was splendid. The atmosphere of Ancient Russia was created by the instrumental folk tunes, performed on various traditional string, wind and percussion instruments. The two songs on the Russian Winter, taken from the Russian comedy movie “Ivan Vasilievich—Back to Future”, directed by Leonid Gaidai, along with traditional gypsy songs were yet another attraction of the day. The performance was like a travel from past to future and proved that psaltery repertoire does not have any chronological limits. Alexander Kadakin, Ambassador of the Russian Federation to India, Fedor Rozovskiy, Director, Russian Centre of Science and Culture, and Prof. Ramadhikari Kumar, President, INDAPRYAL, felicitated the artists with flowers after the concert. Kupina is a laureate of many Russian and international competitions and festivals. Their concert tours were successfully carried out in Italy, Canada, Germany and France. All the artists give lessons of psaltery music to children as per the programme authored by Lubov Zuk. They also contribute to publishing of a magazine “Psaltery Instruments” spread across CIS Countries. The ensemble is also the Honoured Member of the Inter-Regional Public Organisation aimed at promoting Russian and world classical music, and has the awards and certificates of appreciation for their meritorious service to society through art.